After sleeping late and having the huge buffet breakfast in the Ibis, by 11:15 we were on the road north to the Perigueux region, but the little city seemed somewhat bleak to me compared to our usual haunts in the Dordogne. 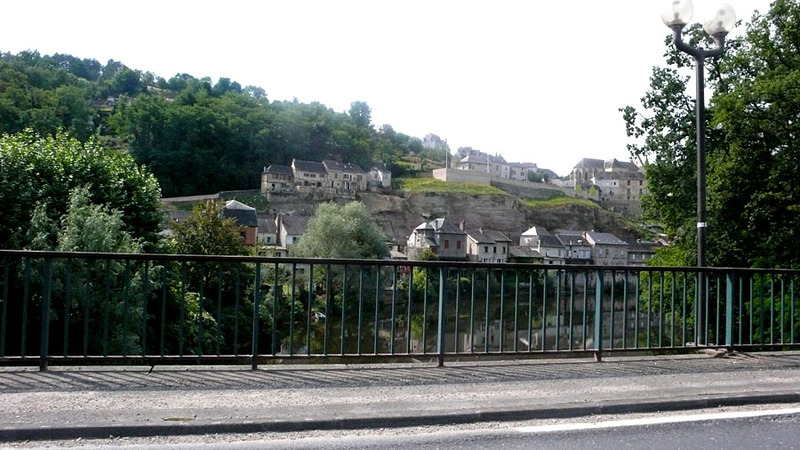 We drove on through it in the direction of a lovely "island" town, Brantôme, built in a loop of the river Dronne and on the route of an ancient Roman highway. In the countryside before reaching Brantôme we stumbled upon a tall stone almost windowless restaurant, Marrakesh. We entered to much ceremony and had as our second lunch in France the lamb tajine and cous-cous menu, accompanied by a really excellent Moroccan gris wine (pale, dry rosé). Things were looking up. The trend continued when we found that the prettiest hotel in Brantôme had a two-night vacancy with a balcony overlooking the river . It gave me pause that the hotel was named Hotel Chabrol (given the plot lines of most Chabrol films), but we decided to consider it a good omen, and very much enjoyed our stay there over the next couple days. We spent the afternoon on a long walk on a little local randonée alongside the river, had dinner in a sidewalk cafe, then walked the river again the opposite direction in the dark before bedtime.